Scores of young fish gleam like sparkling confetti as they swirl around in a submerged metal box. Volunteers and employees of the nonprofit Mattole Salmon Group are tallying fish as they migrate from the Mattole River's headwaters toward the ocean. The workers briefly trap a percentage of the young fish, count and measure them, then release them back to the river. Juvenile salmonids -- the family of fish that includes salmon and trout -- are counted in several ways by scientists. The resulting data is used to analyze the specie's health and understand its habitat needs. Fisheries scientists and volunteers in the Mattole River and throughout the world use the figures from these fish counts as guideposts for action. When the numbers rapidly decline, for one reason or another, experts and activists set about making plans to revive the population and improve its chances for survival. Like the young of any species, the little migrating fish observed during spring and summer monitoring efforts are vulnerable to many predators and pitfalls. Even in optimal conditions, a relatively small percentage return as adults to spawn in their home streams. Still, monitoring adult salmon returns can serve the same purpose as the proverbial canary in the coal mine: When salmon numbers dwindle, it suggests a serious imbalance in the ecosystem. Such is the case on the North Coast. 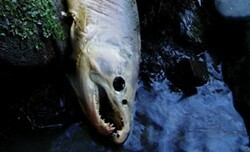 The numbers of coho salmon in river systems throughout our region have plummeted. In the past two years, scientists studying the Mattole River have seen the largest decreases ever recorded. "Historically, the Mattole coho population was estimated to be 20,000 adults per year," said Keytra Meyer, the Mattole Salmon Group's executive director. Scientists last year counted just three adult coho and two underwater egg nests, called "redds." "The 2009-10 run was the lowest we've seen in 30 years of surveys," Meyer said. This year's numbers were a slight improvement -- 10 adults and five redds. But that doesn't necessarily indicate better conditions in the river system. Each group -- or "cohort" -- of Mattole salmon takes three years to complete its life cycle, from birth through growth in the ocean and finally the return to freshwater to spawn. Since 2002, Meyer said, cohort numbers have decreased drastically. The 2009-10 returns, for example, represented a 95 percent drop from 2006-07. This year's decrease was similar. The Mattole River travels a remote 62-mile stretch from its headwaters in northern Mendocino County through the tiny Humboldt County towns of Whitethorn, Honeydew and Petrolia before meeting the Pacific near the westernmost point of the continental United States. To most, the Mattole seems relatively pristine, a little pocket of paradise. Its remoteness has been its salvation in many respects: fishing in this un-dammed river is limited to catch-and-release, and it has experienced minimal genetic influence of fish transplanted from other rivers. The Mattole's small size and its dedicated stewards make it an ideal watershed for achieving land and water management goals, say those trying to save the coho. Three local, grassroots nonprofits are working to return the basin to its optimum function, biodiversity and beauty: the Mattole Salmon Group, the Mattole Restoration Council and Sanctuary Forest. Yet despite the river's isolation and more than 30 years of restoration efforts, coho salmon, the rarest native salmon in the region, are on the verge of extinction. The species' decline here has broader impacts. Throughout the region, watersheds that historically hosted coho runs numbering in the tens to hundreds of thousands are now seeing mere handfuls of fish return to spawn. Dr. Stephen Swales, a scientist with the California Department of Fish and Game (DFG), said coho salmon returns have been dropping -- sometimes precipitously -- in other regional river systems, including Shasta River and Freshwater Creek. Here's a case from another watershed in the region: The population of coho in the Scott River, a tributary to the Klamath that once supported massive runs, is in danger of vanishing due to degraded water conditions. Extinction of a species on a local or individual-population scale is known as "extirpation," and coho in both the Mattole and Scott rivers are facing this serious threat. In the Scott and Shasta Valleys, the decrease in water quality can be attributed in part to such human influences as road building, dams, agricultural diversions and dredge mining, according to a 2007 study by the National Oceanic and Atmospheric Administration (NOAA). But why are coho numbers dropping in the Mattole? There's no single answer. The species is more sensitive than other local salmonids -- it requires plentiful cold, clear water at every life stage and freshwater habitat with plenty of protection for the juvenile fish, which reside in freshwater and brackish areas for a year or more before migrating to the ocean. During winter coho need off-channel habitat -- pools and small channels alongside the primary course of the river that provide safe holding from high flows. "Off-channel habitat restoration seems to be the silver bullet for coho these days," said Bob Pagliuco, a habitat restoration specialist with the NOAA Restoration Center. Pagliuco, who has been working to enhance coho habitat for more than eight years, said coho raised in these habitats grow up to six times faster than fish living elsewhere in watersheds. This improves their chances for survival in the ocean and thus their chances of returning later to spawn. In the summer, coho need cold pools with protective shady covering, which can be provided by fallen wood, trees or other vegetation along streambanks. Coho thrive in water ranging from 39-59 degrees and are rarely found in water that exceeds 70 degrees. (The upper, lethal limit for juvenile coho is about 83 degrees.) As temperatures rise, dissolved oxygen -- the oxygen in the water that fish breathe -- falls. Warm water also fosters oxygen-hogging algae, invasive plant and animal species and bacteria, all factors that stress coho. Often, the last resort for juvenile fish that aren't large enough to live in the ocean -- or that don't make it out of the river before the water heats up -- is to return to cold tributaries in the upper reaches of the watershed. Enter the water crisis: throughout Northern California, including in the upper Mattole, enormous amounts of water are withdrawn from creeks year-round for homestead use. Some of this pumping is legal; some isn't. Studies show that the main reason for low water volume in the Mattole is a change in groundwater storage -- water contained under the surface of the land, as opposed to water we see every day in streams and lakes. A combination of poor past land use practices, an extended dry season, and excessive pumping has deeply affected groundwater. For now, moderating human water use of both surface water and groundwater is the quickest way to improve flows. Sanctuary Forest, a nonprofit based in Whitethorn, has offered water tanks to landowners who agree to fill them with river water only during high winter flows, and refrain from such pumping during the dry season. Though successful in changing some water use habits in the Mattole and reminding residents of the importance of water quantity to fish and wildlife, the water deficiency remains. Throughout the state, diversions of water for agriculture -- both legal and illegal -- and other human uses have harmed salmonid populations. The impacts of agricultural water withdrawals have been debated endlessly in the press and amongst policy-makers and advocates, without many definitive resolutions. Regardless of why the water is removed, coho salmon simply cannot survive in the resulting low, warm flows. Even in our region, which is generally considered to have excess water, the volumes often are not enough to satisfy competing needs. Agriculture, habitat conservation and exportation to drier regions are all powerful and conflicting interests. How did we arrive at this crisis? Haphazard culling of resources, road-building, poor historical forestry practices, unchecked development and excessive fishing have all taken their toll, leading to excessive sediment that impairs water quality, reduces stream-bank vegetation, increases water temperatures and drastically alters watercourses. Sometimes well-intentioned efforts to rectify these issues can backfire. Permitting for restoration or conservation projects is one example. Permits are legally required to alter the course of a stream; landowners must consult with public agencies, and any affected fish must be relocated. These rules represent an improvement over the historical norm, when oversight of such activities was minimal or nonexistent. However, landowners who do not have the time, money or experience to navigate the complex permitting matrix sometimes choose to forgo opportunities for fish and wildlife habitat enhancement altogether. There are numerous efforts underway to improve conditions for both coho and people living alongside them. Nonprofit watershed groups and state and federal agencies are all part of monitoring efforts that inform environmental policies concerning fishing, endangered species listings, water allocation and water quality restrictions, to name a few. And many natural resources management agencies offer free landowner assistance and technical review of projects, helping to ensure that private lands are included in regional restoration actions. The coho on the North Coast are a part of a distinct population that, under the Endangered Species Act, goes by the name of the "Southern Oregon/Northern California Coast Evolutionary Significant Unit," or SONCC ESU. The Mattole coho population is central to recovery for this entire coho "unit," according to the Mattole Salmon Group's Meyer. "The Mattole population must recover for the entire [population] to recover," she said. Coho salmon populations to the north are doing better, with the healthiest runs in colder, rainier river systems. But local fish are not likely to move north because they're hardwired to return to the streams where they were born. So we stand to lose the genetic stock in several rivers. Fish could be artificially added to these systems from elsewhere, but they can't replace the population that has evolved to fit the river's specific conditions, Meyer explained. Triage measures are under way to help protect the genetic stock of the Mattole and other imperiled rivers. The Mattole Salmon Group, working with state and federal agencies, hopes to use coho nurseries to increase survival ratios. This system involves raising the fish in large, water-filled rearing tanks to avoid inhospitable in-stream conditions. Later, the fish are released into the ocean. This tactic is known as recovery rearing, and the Mattole Salmon Group already has most of the equipment needed to do it. However, water levels in many of the tributaries are so low that the Department of Fish and Game is concerned that diverting the water into the rescue tanks would jeopardize other aquatic life. The Mattole Salmon Group has proposed removing fish from the stream and rearing them in one of these rescue facilities, Meyer said. But due to permitting constraints, the California DFG and NOAA Fisheries have suggested moving those fish out of the Mattole basin for rearing. They could later be brought back and released. Conservation hatcheries are another option, though they're typically used only as a last resort. In these facilities, particular attention is paid to maintaining genetic diversity and reducing artificial selection -- human selection of fish for breeding. Locally, there are hatcheries on the Klamath and Trinity rivers, but these are mitigation hatcheries; their purpose is only to augment the natural population of the river, not preserve unique genetics. There are two conservation hatcheries in northern California -- one near Geyserville and one in Santa Cruz County. However, the hatchery system is not without critics. Some fisheries scientists worry that fish suffer strain during transport and rearing. These scientists are also concerned about disease, the potential for vandalism that might harm the fish, and possible genetic crossover with fish from other rivers that may be hosted on site. The agencies responsible for conserving coho have been enacting protection and restoration measures for many years. Commercial and recreational fishing of coho salmon has been illegal since the early 1990s. Habitat improvement has been a major focus of fisheries management agencies since the early 1980s. Many grass-roots groups recognized problems as early as the 1970s and responded on a community level by working to improve habitat and monitor fish as volunteers. Also, regulatory enforcement has been stepped up, so careless land use practices are less common. Specific industries, including forestry, gravel mining and construction, have been required to abide by strict rules. There have been repeated efforts to list the local coho population as federally endangered (currently they're listed as threatened), a step that could bring more money to the troubled local watersheds. However, the endangered listing could be problematic since it brings more restrictions and expensive processes to struggling communities. The California DFG is among the agencies responding to the threats facing northern California coho. In 2004 the agency published a report outlining a strategy for recovery, which includes addressing habitat needs as well as policies that govern human use of resources. NOAA Fisheries, U.S. Fish and Wildlife Service, and fish and wildlife managers in Oregon are responding with their own strategies, assigning staff to work exclusively on coho recovery. By the time this story goes to print, NOAA Fisheries will have released its Coho Recovery Plan for this region for agency technical review. After these agencies' comments are incorporated later this year, the document will be made available for public comment. Local watershed groups, such as the Mattole Salmon Group, have been producing recovery and watershed plans and implementing watershed-wide restoration programs for several years. Now these complex plans for habitat restoration are being ratcheted up. The hard work of implementing the plans must be done by the managers themselves or facilitated through grant money and support to watershed groups, other non-governmental organizations (NGOs) or private landowners. Meyer, an NGO representative who has also worked in a government setting with NOAA Fisheries, said coho recovery in the Mattole cannot be achieved without NGOs like the Mattole Salmon Group. "In a rural environment, working with us is the best way to get support from landowners," she said. "We have a relationship with them and have better access to the community's resources." In order to foster a "big-picture collaborative approach," she said, government agencies should continue to delegate work to watershed groups that have strong community ties. Not surprisingly, one of the key challenges to these efforts is availability of funding. Meyer believes that this, along with political limitations and regulatory challenges, are the primary constraints. "There are scientists and restorationists who know what to do and can do it," she said. "We need support, money and a streamlined permitting process." The South Fork Eel River is also a promising stronghold for coho in the region. It currently has the strongest coho population in California. Swales, the DFG scientist, noted that landowners here have made all the difference. "The major contrast with the Mattole is that the area is owned and managed by large industrial resource companies," he said. "Today, these landowners' management is very responsible." This lighter footprint is due to both the landowners' desire to be good stewards of their land and the oversight of state and federal agencies. Staff of these agencies review timber harvest plans and water diversion permits, and cooperatively implement restoration projects. Thanks to these combined efforts, the number of adult coho observed in some South Fork Eel tributaries has recently numbered in the hundreds, an encouraging sign though still nowhere near the historic runs of about 20,000 adult coho annually. But scientists and regulators aren't the only ones with the power to help the situation. Activities in our daily lives can have the most sizable impacts on salmon. Coho are negatively affected by excessive use of water in the dry season for those on private systems. Meyer encouraged people to support watershed-based planning and be aware of their own impacts. "Each person needs to think about how every single action they take affects their watershed -- how much water you use, the food you buy. People need to let their legislators and community know that they support healthy watersheds and the recovery of salmon populations." Swales agreed that public understanding and support are key. He said that eliminating pollutants and maintaining vegetation alongside streams to shade and cool the water are essential to preserving water quality. He also suggested becoming more involved in local land use planning decisions. Here, this could include the Humboldt County General Plan update, which is currently approaching its final stages before moving from the planning commission to the board of supervisors. Dan Ehresman, a policy analyst with Healthy Humboldt, said that professionals in watershed restoration have developed policy proposals that would help safeguard local watersheds and restore fisheries. "Right now is a great time to write a letter to the planning commission and supervisors in support of watershed protection and salmonid recovery," he said. Weeder said landowners can help by working with restoration groups and fencing livestock out of streams. "Without public support and involvement, recovery of this species is unlikely, because most of the factors which are impeding its recovery are in the public's control, and most of the land which could support good juvenile habitat is not managed by the federal government," she said. Meyer pointed out that it remains important to create incentives for private landowners, including funding and permitting assistance. There are many species on earth that have been lost through mismanagement or misunderstanding of the natural environment, but there are success stories, too. Charlotte Ambrose, the NOAA Fisheries recovery coordinator for the central California coast, sees a parallel between coho and other species that have recovered with human help, such as the California condor, which was saved from almost certain extinction by carefully managed rearing and reintroduction programs. Even if we reach the precipice -- where coho simply cannot naturally reproduce in their native streams without help -- we have the ability to keep them alive until restoration efforts are fully implemented and the watersheds heal. Though controversial and not without flaws, such last-resort rearing techniques may help keep local stocks of coho salmon on this planet for future generations. "Coho have been around for thousands of years, and the experience they have to undergo to complete their life cycle is amazing," Meyer said. "They are a totem species, an indicator of watershed health. By improving conditions so they can survive, you are simultaneously improving all life. ...The time is now. This is a crisis and we have to do as much as humanly possible." Natalie Arroyo is proud to live and work in charming, lovably wacky Eureka. She has worked in fisheries and natural resources management for six years. She enjoys obsessive agate hunting, spontaneous dancing and correspondence from respectful folks via email (nattlestargalactica@gmail.com). Her alter-ego/bonus-bogus persona, G-Ma, was recently crowned the 2011 Rutabaga Queen.